Well, we missed picking blueberries again this summer. I seriously don’t know how we’ve managed to do this for the third summer in a row but somehow, July and early August just sneak by without a spare Saturday to hit up the local blueberry patches. We did, however, stumble upon a blackberry u-pick field while we were cruising around the north shore of my old stomping grounds early last week. What a day it was! The night before was filled with a fun family wedding at an aquarium (such a great place!) and we took Monday off to get in some sun and relaxation before heading home. Windows down. Music up. Long Island’s farm and wine country. Sea air creating those never-ceasing and uncontrollable ringlets with my not-tightly-enough pony-tailed hair. We had an inkling of what vacation feels like. Our intention was to pick blueberries but we filled up 3 pint baskets with gorgeous blackberries instead. 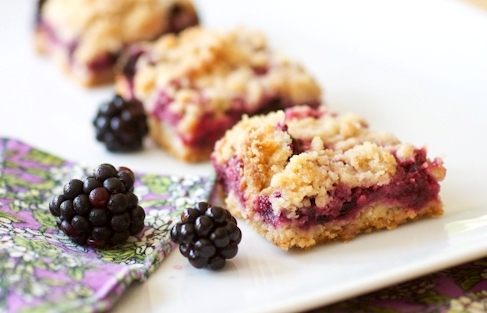 No complaints here, especially considering we got these blackberry lime crumb bars out of the deal. 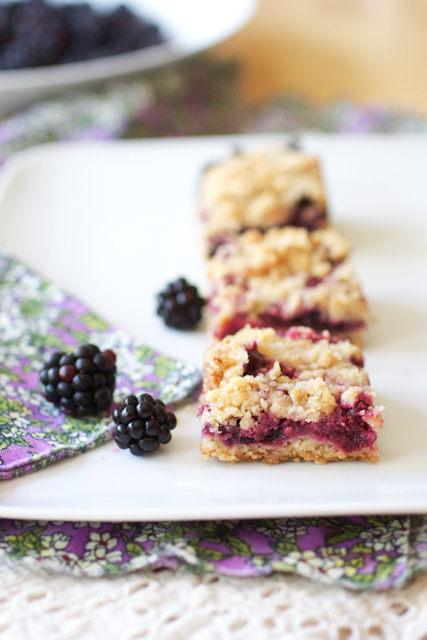 A quick stir together of blackberries, sugar, cornstarch, and lime juice (to help the blackberries break down) is sandwiched between a crumb mixture that acts as both the bar base and topping. So simple. So amazing. And yep, so versatile too – strawberries, peaches, blueberries, apples, raspberries (you get the point) all work beautifully here so you can’t possibly choose the wrong fruit! The original recipe calls for lemon zest and juice but lime seems to be a more natural choice to use with blackberries. If you use other fruits, choose your citrus according to what works best with that fruit. Preheat the oven to 375° F. Grease a 8x8-inch pan with butter or cooking spray and set aside. In a medium bowl, combine 1/2 cup of the sugar with the baking powder and flour. Lightly whisk in the salt and the lemon zest. Cut in the butter and half of the beaten egg with a pastry blender (or two knives or your fingers) until the butter is about pea-sized - the mixture should be crumbly without much loose flour. Spread a little more than half of the dough mixture in an even layer over the bottom of the prepared pan and press down firmly to form the bottom crust. In another medium bowl, stir the remaining 1/4 cup sugar, cornstarch and lime juice together. 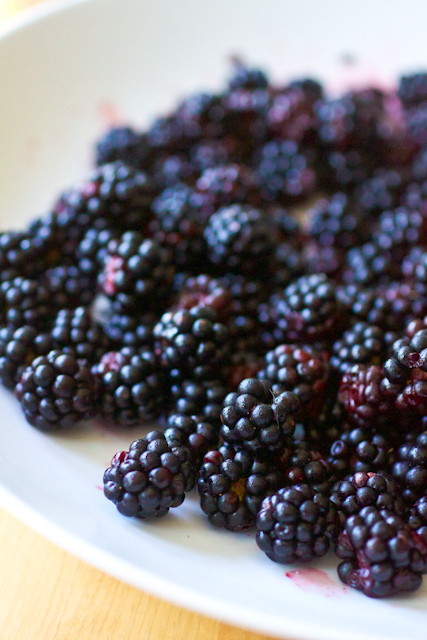 Gently mix in the blackberries with a rubber spatula until combined. Spread the berry mixture evenly over the bottom crust. Crumble the remaining dough over the top of the berries. Bake for 45-50 minutes or until the top is slightly golden brown. Cool completely before cutting into squares and serving. These bars keep well refrigerated for 2-3 days. Preheat the oven to 375° F. Grease an 8×8-inch pan with butter or cooking spray and set aside. In a medium bowl, combine ½ cup of the sugar with the baking powder and flour. Lightly whisk in the salt and the lemon zest. Cut in the butter and half of the beaten egg with a pastry blender (or two knives or your fingers) until the butter is about pea-sized – the mixture should be crumbly without much loose flour. Spread a little more than half of the dough mixture in an even layer over the bottom of the prepared pan and press down firmly to form the bottom crust. In another medium bowl, stir the remaining ¼ cup sugar, cornstarch and lime juice together. Gently mix in the blackberries with a rubber spatula until combined. Spread the berry mixture evenly over the bottom crust. Crumble the remaining dough over the top of the berries. Bake for 45-50 minutes or until the top is slightly golden brown. Cool completely before cutting into squares and serving. These bars keep well refrigerated for 2-3 days. I love the blackberry lime combination! Yum! Ohhhh, I am loving the blackberry and lime flavor combo!!!!!!! and anything with a crumb topping is just delightful!